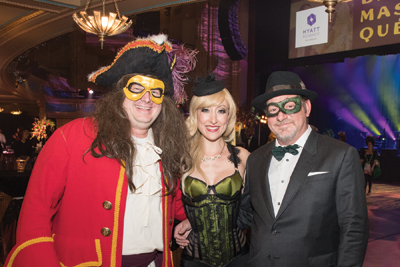 The second annual Link Stryjewski Foundation “Bal Masqué” celebrated New Orleans’ Creole Carnival roots. Masked guests stepped back into the 17th century for an evening filled with food, wine and enchanting entertainment. Eight nationally renowned chefs prepared the special menu for the evening. On the roster: John Currence of City Grocery from Oxford, Mississippi; Suzanne Goin of Lucques from Los Angeles; Paul Kahan of Publican from Chicago; Mike Lata of FIG from Charleston, South Carolina; Nancy Oakes of Prospect from San Francisco; Richard Reddington of Redd from Yountville, California; Andrea Reusing of Lantern from Chapel Hill, North Carolina; and Maggie Scales of La Boulangerie, New Orleans. Dr. John & the Nite Trippers headlined the musical entertainment. Dr. John was also joined by Big Sam’s Funky Nation, The Roots of Music and Cha Wa Indians. The Merry Antoinettes also made an appearance. Approximately 400 people attended this year’s event, which supported the Link Stryjewski Foundation’s mission to nourish and educate the city’s youth and break the cycle of violence and poverty.